Proactive measures by government and private organizations have enhanced the efficacy of Canada's transportation networks and made the country an ideal place from which to serve global markets. Canadians naturally have a more globally oriented mindset than most Americans. Maybe this is because of the country's large land area, or its dispersed population, or the international heritage of its people. Regardless of the reasons, the country prides itself on its strengths in global trade and has made great strides to maintain its international links. The Atlantic provinces are intimately tied to Europe, and the Pacific and Mountain provinces look to Asian trade for their sustenance and their future. And, of course, there's that large mass of land, population, and trading partners to the south as well. The Canadian federal government, the provincial governments, and private industry coalitions are moving toward strengthening this core pillar of the economy. These improvements should strengthen the overall Canadian economy, and could provide some interesting opportunities for companies seeking more efficient linkages to global markets. The United States is Canada's largest trading partner, and since 9/11 Canadians have shared U.S. border security concerns. As a result, the Canadian federal government has positioned itself as a solid partner to the United States on security matters, while also trying to pave the way for businesses on both sides of the border. The Canadian and U.S. governments have progressively established programs that enhance border security for both countries, and which also ideally facilitate and encourage cross-border trade. Key among these programs are Partners in Protection (PIP) and Customs-Trade Partnership Against Terrorism (C-TPAT). The Canadian Border Services Agency (CBSA) originally conceived the PIP program in 1995 as a mechanism for private industry to play an active role in improving border security through pre-screening and voluntary security procedures. CBSA then strengthened the program following 9/11 as a response to heightened security requirements. The U.S. Customs and Border Patrol put its own, similar measures called Customs-Trade Partnership Against Terrorism (or C-TPAT) in place in 2003. Border security became part of the war on terror when Customs and Border Control (CBP) moved into the U.S. Department of Homeland Security following 9/11, and inspection of containers and other cargo took on added significance. The CBP then recognized that the shippers themselves could become an integral part of strengthening this first line of defense. The PIP and C-TPAT efforts are complementary, but are not explicitly tied together. The American and Canadian governments next decided to both link the CTPAT and PIP programs and to establish new programs to expedite trade across the border. Key among these is the Free and Secure Trade or FAST program. This joint program between U.S. Customs and the Canadian Border Services Agency provides for risk assessments of drivers, carriers, importers, shippers, and others frequently working across the border. Much like the airport Nexus program for U.S. passport holders, FAST provides pre-cleared drivers and shippers with coded documents that may be presented at the crossing and scanned quickly. This allows the shipments to pass more quickly and also permits the border services to focus their attention on potentially higher risk cargoes. It also allows the shipper to better predict exactly how long the crossing will take. The border services have dedicated lanes for FAST cargoes at key crossings in Washington State (to British Columbia), two between Ontario and Michigan, and one between Quebec and upstate New York. There are additional FAST sites at another 15 border crossings. The scope of this cooperation extends to the highest levels of both governments. Prime Minister Harper and President Obama announced new measures in February intended to create a common perimeter around both the United States and Canada. By extension, this denser level of outer security would provide the level of comfort required to allow for some "thinning" of the U.S.- Canadian border itself. Consequently, as a response to the federal efforts and as a proactive step to establish a better trading environment going forward, the Canadian Manufacturers and Exporters (CME) association launched the B3– Businesses for a Better Border initiative in late 2010. The CME began the B3 initiative to augment earlier, government-run efforts to expedite trade, such as PIP, C-TPAT, Customs Self-Assessment (CSA), and FAST. Despite these programs, the founding members of B3 felt that the compliance hurdles at border crossings were a continued barrier to effective and efficient trade. The American Automotive Policy Council, Canadian Vehicle Manufacturers' Association (CVMA), as well as the U.S. National Association of Manufacturers (NAM) also joined as key founding members of B3 and have vowed to work with border agencies on both sides to establish enhanced security and regulatory compliance measures. In exchange, the program should ensure that trusted shipper members gain expedited passage and other incentives. Even while Canada has entered into solid arrangements with the United States for cross-border trade, the country has created new initiatives for improving its already strong connections with Asia. First announced in 2006, Canada's Asia-Pacific Gateway and Corridor Initiative is an integrated set of investment and policy measures focused on the network of transportation assets and corridors across western Canada. By investing in infrastructure, the Canadian federal government plans to strengthen the country's overall trade position, particularly with respect to trade with Asia. Main investments include strengthening road, rail, and air connections between the Pacific ports of Vancouver and Prince Rupert and various production and logistics centers across the country. The initiative is also aimed at making the Canadian transportation network a more attractive alternative to companies in the U.S. Pacific Northwest and Midwest looking to move materials to and from Asia. The initiative focuses on gateways and corridors, providing fully integrated ways of moving goods between North American and Asian markets. 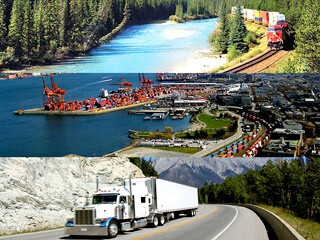 For example, by investing in the Canadian National and Canadian Pacific railroads — as well as in infrastructure at key border crossings — the Canadian transportation network can provide a seamless, one-carrier network to bring materials from Asia to markets such as Memphis, Minneapolis, and Chicago. Of course, all of this investment may be a defensive response to expansion of the Panama Canal. The canal's third, wider set of locks is due to open in 2014, allowing shipping traffic to more directly bypass the congested ports of the West Coast and directly serve the population centers of the Gulf and East coasts. Through the Asia-Pacific Gateway Initiative, the Canadian government may be attempting to proactively cut off any diversion from its Pacific ports by creating a better, faster, more flexible solution for shippers to move goods from Asian points of origin to the population centers of Ontario, Quebec, and the U.S. Midwest. What does this mean for companies looking to do business in North America and globally? First, the U.S.- Canada programs — both those created by the government and by private business — are creating mechanisms for the accelerated passage of raw materials and finished goods across the border. This should create a more efficient logistics network that will ideally not even recognize the border as a chokepoint or barrier. This would, in turn, allow companies to locate key points of sourcing, logistics, manufacture, assembly, and final distribution in whatever area of North America makes sense for labor, cost, access to markets, or other key inputs. In other words, the continent would act as one cohesive, fully integrated market. At the same time, Canada's moves to create an integrated transportation network — efficiently funneling goods between Asian and North American markets — strengthens the country's global linkages. Canadian markets located along this enhanced artery could benefit significantly from increased investment from companies whose desire is to efficiently serve Pacific markets. It may also attract companies that want to quickly accept shipments from Asia and integrate these cargoes into their products. Christopher Steele is president of CWS Consulting Group, a business consulting firm specializing in location strategy, site selection, industrial development, and business attraction. He previously served as president of the Real Estate Line of Business at TranSystems and as a senior manager in Ernst & Young's Real Estate Advisory Services group. He may be reached at chris.steele@cwsgrp.com or you may follow his tweets at @cwsgroup.